Non-exposed endoscopic wall-inversion surgery (NEWS) has been developed as an endoscopic full-thickness resection technique without translumenal communication to avoid intraabdominal infection or tumor seeding. 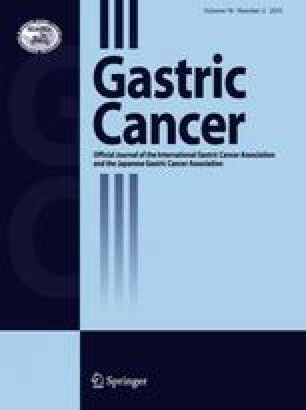 We aimed to investigate the feasibility and safety of NEWS with sentinel node basin dissection (SNBD), which can minimize the area of lymphadenectomy for early gastric cancer (EGC), in 10 porcine survival models. After placing laparoscopic ports and making markings on both the mucosal and serosal sides of a simulated lesion, indocyanine green fluid was endoscopically injected into the submucosa at 4 quadrants around the lesion. An SN basin including the stained SNs was dissected, and a circumferential sero-muscular incision around the lesion and sero-muscular suturing were performed laparoscopically, with the lesion inverted toward the inside of the stomach. Finally, circumferential mucosal incision and transoral retrieval were made endoscopically. In all cases, the lesion was resected in an en bloc fashion, and all pigs survived without adverse events. After 1 week of observation, pigs were sacrificed for macroscopic investigation. The average procedural duration was 170 min (range 130–253 min). Intraoperative perforation occurred in 1 case, which could be safely treated by laparoscopic suturing. The number of dissected SN basins was 1 in 9 cases and 2 in 1 case. Necropsy revealed no signs of severe complication. This animal survival study demonstrated that NEWS with SNBD was safe and feasible. It may provide patients with possibly node-positive EGC a minimally-sized local resection and minimally-ranged lymphadenectomy without the risk of tumor dissemination. Endoscopic resection as represented by endoscopic submucosal dissection (ESD) has been widely accepted as a curative treatment method for node-negative early gastric cancer (EGC) [1, 2, 3, 4, 5]. On the other hand, gastrectomy with standardized lymphadenectomy is necessary for possibly node-positive EGC in the current situation . As one promising option of function-preserving surgeries, local resection navigated by sentinel node (SN) mapping is introduced [7, 8]. In this theory, if no metastasis to SN identified by a radiolabeled material or a dye is revealed during the operation, the area of lymphadenectomy can be minimized. Therefore, partial or segmental resection with SN basin dissection as minimally-ranged lymphadenectomy is expected to avoid wide resection of the stomach. However, these resection options for the primary site are still inadequate to minimize the resection area of the gastric wall as much as possible because a tumor margin cannot be visualized from the serosal side. Several local resection techniques using a flexible endoscope have been introduced in order to minimize the resection area by confirming the border of the lesion [9, 10, 11]. These techniques, however, necessitate intentional perforation during the procedure, which can raise a possibility of tumor dissemination if neoplastic cells of the lesion are exposed. Accordingly, these methods are limited to gastric submucosal tumors (SMTs) without ulcer formation and are contraindicated to cancers. Non-exposed endoscopic wall-inversion surgery (NEWS) has been developed as full-thickness resection without translumenal communication [12, 13, 14]. Due to the advantage of no risk of intraabdominal infection, NEWS has already been clinically introduced for gastric SMTs at selected hospitals. Furthermore, this promising technique can be applied to possibly node-negative EGC which is difficult to resect by ESD, as suggested in the first report of NEWS . We expect that an ideal function-preserving surgery can be realized for possibly node-positive EGC by fusing NEWS with SN navigation surgery (SNNS). Therefore, we aimed to investigate the feasibility and safety of NEWS with SN basin dissection (SNBD) in a porcine survival study. After approval from the institutional review board of the Laboratory Animal Center at Keio University School of Medicine (IRB no. 12076-0) in terms of both potential scientific contribution and ethics in animal protection, a survival experiment of NEWS with SNBD was performed on ten female pigs weighing approximately 25–30 kg each in the animal research facility at Keio University, School of Medicine. Surgery was executed under general anesthesia induced by intramuscular administration of midazolam (0.2 mg/kg), medetomidine (0.1 mg/kg), and atropine sulfate (0.02 mg/kg), and maintained by inhalation of isoflurane. 0.5 g of cefazolin sodium hydrate was injected intramuscularly just before the procedure. The experiment was conducted using ten pigs, each of which had one simulated lesion. Ten lesions were located on the anterior wall, posterior wall, and greater curvature in the upper, middle, and lower third, and on the lesser curvature in the middle third of the stomach, respectively. Although the lesions were created to cover almost all parts of the stomach in this study, we made only one lesion in the middle third of the stomach as a representative on the lesser curvature because the lesser curvature was too short and bent too much to create three lesions due to the innate characteristic of the porcine stomach compared to the human one. After setting a pig in a spine position, one camera port and four trocars were inserted. Mucosal markings were placed around the simulated lesion approximately 4 cm in diameter using a tip of Dual knife (KD-650L; Olympus Medical Systems, Co., Ltd., Tokyo, Japan). Subsequently, the Dual knife was pushed deeper into the gastric wall by the endoscopist so that the location could be recognized from outside of the stomach by the laparoscopic surgeon, who then placed serosal markings using a spatula-type electrode (A6284; Olympus). The location of each marking was also confirmed by a transparently visible shadow of the device from the opposite side. In case of difficulty in placing serosal markings due to the existence of an SN basin, the markings were made after the SN basin dissection. After creating the lesion, 0.5 ml of 5 mg/ml indocyanine green (ICG) fluid solution was endoscopically injected into the submucosa at four quadrants around the lesion (Fig. 1a). SNs stained with ICG were identified approximately 10 min after injection, and an SN basin including the stained SNs was dissected laparoscopically using the electrode, or SonoSurg (Olympus). SN basins were divided into five parts according to the distribution of feeding arteries: right and left gastroepiploic artery (GEA), right, left, and posterior gastric artery (GA) . Subsequently, circumferential sero-muscular incisions were made approximately 5 mm outside the serosal markings with the spatula-type electrode or the SonoSurg, and sero-muscular continuous suturing was performed, with the lesion inverted toward the inside of the stomach (Fig. 1b–d). To facilitate the subsequent endoscopic procedure, a formed polyurethane elastomer sheet (Kyowagiken Co., Ltd., Saitama, Japan), optimally cut according to the lesion size, was inserted between the serosal surface of the inverted lesion and the sutured layer on the way of suturing (Fig. 1c). Finally, a circumferential mucosal incision was made with the Dual Knife (Fig. 1e–h), and the lesion as well as the sheet was retrieved transorally. The procedure was finished by removing the port and trocars and suturing abdominal incisions. After awaking from anesthesia, the pigs were allowed to drink water, and started to feed on the next day of operation. 0.5 g of cefalexin was given with diet until the third day after the procedure. Pigs were sacrificed on the seventh day for macroscopic investigation of the abdominal cavity and the stomach. As the primary outcome measure, survival rate in the observational period was investigated. As secondary outcome measures, technical feasibility, complications, and gross findings on necropsy were assessed. All pigs survived surgery without adverse events (10/10, 100 %). The full-layered lesion was resected in en bloc fashion in all cases (Fig. 2a, b). The average size of the specimen was 41 mm (range 25–60 mm), and the average procedural duration was 170 min (range 130–253 min). In one case on the lesser curvature, perforation at the phase of sero-muscular incision and incision of the suture at the phase of mucosal incision occurred, which could be safely treated by laparoscopic suturing. In another case, the sheet was unexpectedly sutured at the end of the sero-muscular suturing, which was resolved by opening the anastomotic site and suturing the full layers again after retrieving the specimen and the sheet. SN basins were dissected as follows: right GEA in five cases, left GEA in two, right GA in two, left GA in one, posterior GA in one (two basins were dissected in one case), respectively (Fig. 2c). The average weight change in the observational period was +1.3 kg (range −0.4 to +3.3 kg). Necropsy revealed mild adhesion of the suture site to surrounding organs in all cases, but no signs of severe complication, e.g., anastomotic leak, necrosis of the gastric wall, or peritonitis were shown (Fig. 2d–f). In two cases, a small amount of lightly yellowish, serous ascites was collected, which was suspected mild lymphorrhea. The results are shown in Table 1. This animal survival study demonstrated that NEWS with SNBD was safe and feasible. Technical feasibility of NEWS in both animal and human cases has been already confirmed by previous reports [13, 14]. Therefore, this experiment was conducted to investigate safety and feasibility of NEWS combined with SNBD with special reference to stability of the remnant stomach after removal of feeding arteries and part of the gastric wall. The result that all pigs survived with the stomach unchanged suggests that NEWS with SNBD can be safely introduced to humans. We demonstrated that the postoperative outcomes of NEWS with SNBD were favorable irrespective of the location, but failed to elucidate the technical durability for the lesion on the lesser curvature in this study. One reason is thought to be due to anatomical characteristics. Because the lesser curvature of the porcine stomach is very short and bent, a space is not enough for both endoscopy and laparoscopy to work well. Therefore, for the lesion where visibility and maneuverability were poor such as on the lesser curvature of the porcine stomach, NEWS should be carefully performed. Other reasons may be related to a learning effect and the number of cases. The perforation occurred in the fourth case, which might mean it is too soon to try NEWS in cases which would be difficult. Furthermore, if we had had a sufficient number of this case for this study, successful cases on the lesser curvature would have compensated for just one perforation case. From previous experience of NEWS in animal and human cases [12, 13, 14], we realized that to find the space between the sutured sero-muscular plane and the serosal surface of the inverted lesion was very important for safe and successful resection. The inserted elastomer sheet can be a milestone to find that space. Although it may not be absolutely indispensable, a spacer such as the elastomer sheet would be very helpful to facilitate the endoscopic procedure. Mitsui and colleagues attempted endoscopic clipping after the resection in clinical cases , whereas we omitted it in this study. Although the effectiveness of placing endoscopic clips in the NEWS procedure is unknown, mucosal closure using clips can be of some help to avoid anastomotic leakage or postoperative bleeding. Because we should carefully and safely introduce the new technique to human cases, it would be better to perform endoscopic clipping, at least while NEWS is thought to be a new technique. If NEWS with standard regional lymphadenectomy was performed for possibly node-positive cancers, a remnant stomach might be necrotized because the standard lymphadenectomy requires multiple removal of feeding arteries. Therefore, NEWS for possibly node-positive EGCs must be accompanied with minimally-ranged lymph node dissection. At the current moment, we consider that NEWS should be applied when one SN basin is to be dissected. Although one case in which two SN basins were dissected survived without complications in this study (Case No. 3), further investigation would be required to expand the indication of NEWS with SNBD for the patient’s safety. There are some reports regarding feasibility of ESD with lymphadenectomy for possibly node-positive EGC [15, 16]. However, cancers massively invading into the submucosa, which is a representative of cancers having a risk of lymph node metastasis, might be resected with a vertical margin positive by ESD. In this situation, ESD with lymphadenectomy cannot be regarded as a radical surgery. Basically, submucosal cancers should be removed on a full-thickness condition in order to obtain en bloc complete resection. One concern is the risk of recurrence from lymphatic vessels around the primary lesion, although the probability of survival of cancer cells in lymphatic vessels would be quite low. In a clinical situation, it might be better to add the dissection of the sero-muscular layer where lymphatic vessels are stained, followed by sero-muscular suturing. Inoue and colleagues introduced CLEAN-NET as another promising non-exposure method . In this procedure, a lesion is laparoscopically pulled toward the outside of the stomach after circumferential sero-muscular incision, and is finally resected using a linear stapler. Unlike NEWS, sero-muscular hand suturing and circumferential mucosal incision can be skipped in CLEAN-NET, which will have a shorter procedural time than NEWS. In this method, however, the resection area of the gastric wall cannot be satisfactorily minimized because a mucosal border of the tumor cannot be confirmed at this step of the resection. 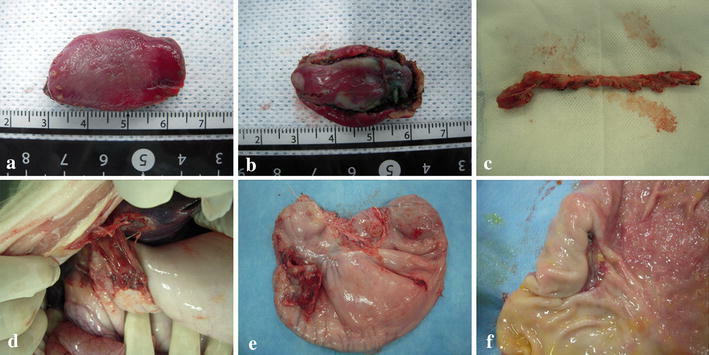 Therefore, wide resection is always necessary to avoid a tumor-positive margin of the specimen, which may result in unacceptable deformity of the residual stomach. Furthermore, if possibly tumor-positive lymphatic vessels are to be resected with the primary lesion, the resection area would become even wider. On the contrary, deformity of the residual stomach can be minimized in NEWS, which is one of the distinctive advantages of NEWS, because the operators can optimally and minimally delineate the resection area. Although NEWS may be more complicated and time-consuming than CLEAN-NET, it would provide more merits for patients than CLEAN-NET. There are several limitations to this study. Firstly, this was an animal study in a small number of cases on each condition. Secondly, the observational period was relatively short, although 1 week was thought to be enough to verify whether the pigs die from necrosis of the stomach from this procedure. Thirdly, a single tracer method was performed to detect SNs. Currently, a dual tracer method with a radiolabeled material and a dye is clinically recommended for the accurate detection of SNs. Finally, participating operators were limited. Further investigation with various endoscopists/laparoscopists will be needed. In conclusion, we elucidated the feasibility and safety of NEWS with SNBD in a porcine survival study. This method may provide patients with possibly node-positive EGC a minimally-sized local resection and minimally-ranged lymph node dissection without the risk of tumor dissemination. O.G. was funded by a Grant-in-Aid for Young Scientists from The Ministry of Education, Culture, Sports, Science and Technology in Japan in 2012–2013 (Grant No. 25860558).